When it comes to workflow management software, particularly as it pertains to documents, this article is designed to give you the what, the why, and the how. Then hopefully, for the sake of your business, becoming an adopter is just a matter of when. If you’re in the business world and you’ve encountered at least a few conversations about B2B software, there’s a good chance you’ve heard of software that addresses “Workflow” or “Workflow Management”. There’s also a good chance, however, that you’re still not entirely certain of the functionality and day-to-day applications of what that entails in the context of managing critical business documents—distributing them, submitting them, collecting signatures on them, etc. By definition, workflow solutions simply assist and optimize “…processes through which a piece of work passes from initiation to completion”, but what’s important to understand is exactly how good software in this space actually enables that optimization. 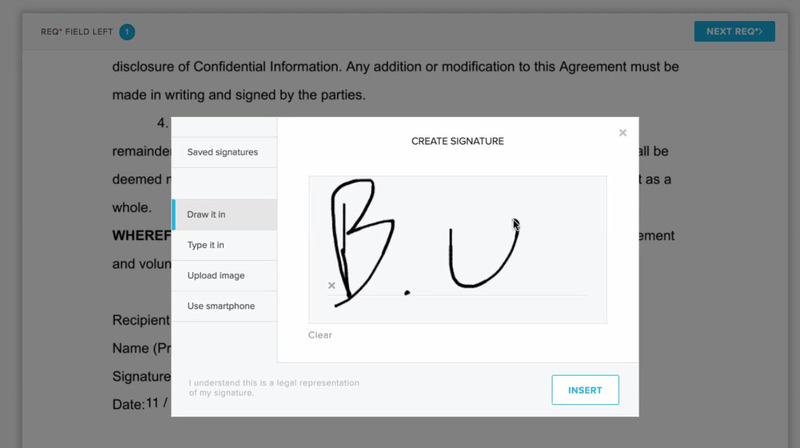 Because we’re big fans of learnin’ stuff here at SnapMunk, we thought we’d help out by way of example; we’re going to explain the kind of functionality provided by well-designed workflow solutions by running through some feature highlights of the HelloSign eSignature platform. At the very core of a good document workflow solution is making sure things happen in the right sequence, making sure the right people see the right things at the right time, and making sure nobody works too hard to get all that accomplished—intelligent use of automation is key. Let’s turn to the HelloSign platform to illustrate that kind of support, using three simple but powerful examples. A key to any successful workflow is sequence; when gathering legally binding signatures on a document, that comes into play when ensuring that everyone sees and signs the document in the order that allows for proper execution. Up to 20 different signers can be defined, and rather than someone having to walk into a bunch of offices or send a bunch of different emails after each party has signed, the system automatically releases the document to each party only after the necessary preceding signer has finished. The automation removes all unnecessary delay, and drastically reduces overall effort and margin for error in process (we’ll talk more about that below). When executing critical business documents, time is of the essence. A workflow solution would be a whole lot of hand-waving if there were no automated intelligence to help keep things on schedule. 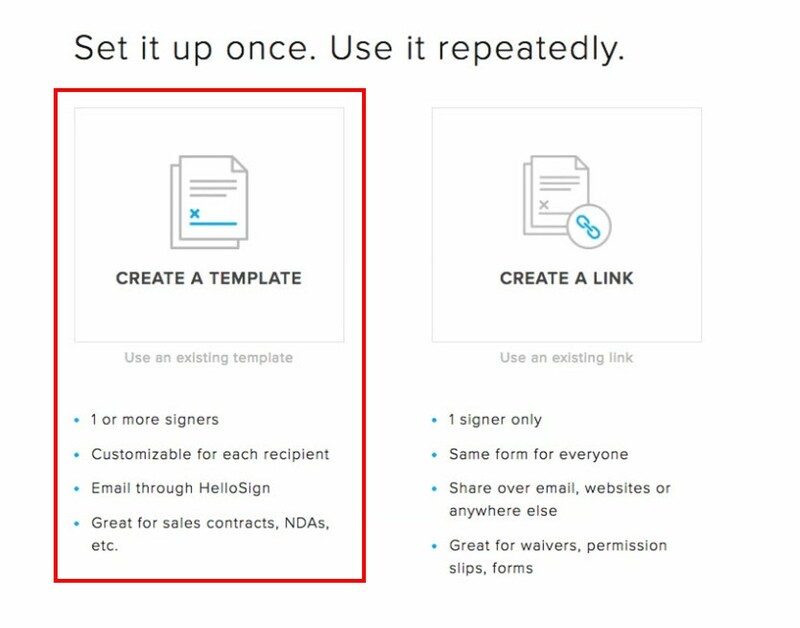 Whenever a document has been distributed for signing, the HelloSign platform automatically schedules two reminder emails to be sent to the signers on the 3rd and 7th day after initial request (assuming they haven’t signed by those days). While those are the default settings, the timing of those follow-up emails is entirely customizable to suit any company’s turnaround requirements. The platform also offers a way to apply a “final approval” at the end of a signing stretch. 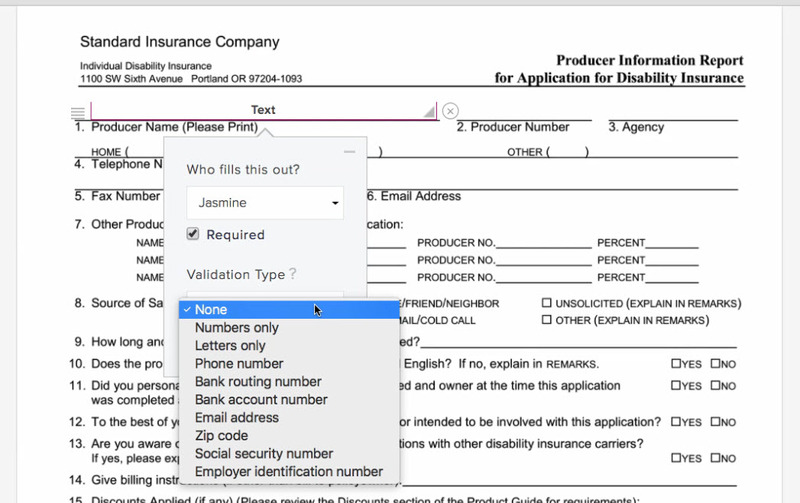 If there is a final set of eyes, and a final signature needed to execute a document, users simply add them as the last recipient in the order—they only see the document when it’s ready for their review—and built into the system is an option for them to Decline to Sign—the process is halted and the person administering the signings is notified of the block. At the end of the day, much like the motivation behind going paperless as a whole, a workflow management and optimization solution should make things faster than before, easier than before, and as a result of leveraging a software system with rules, more streamlined and consistent than before. Those, after all, are the keys to operational efficiency and a better bottom line. We’ve already touched on this (and we’ll touch on it a bit more) but at a high level the benefits of a system-driven, hands-off process cannot be understated; the less time people are spending on tedious tasks and checks and balances, especially in an area where so many minor things can be missed, the more effective and profitable your business will be. To optimize a workflow, you need to eliminate repetition and maximize standardization—in other words, you need to be a stickler for streamlining. One key way in which a software solution can help you achieve this is through the creation and management of Templates. If your company is constantly using and signing the same types of documents—ones that only have a few fields needing update each time they’re executed (e.g., NDA)—there is no reason why someone should be uploading, editing and creating a digital, signable version of that document every time it needs to go out. It’s highly inefficient, and not to mention risky to open the process up to people forgetting critical fields, or putting the wrong things in the wrong places. HelloSign allows you to create an e-signable document, complete with all necessary fields, that can be saved and reused over and over, cutting down time-to-execute by a ton. If it’s a document that doesn’t need any customization prior to sending it out (e.g., a basic waiver), it gets even easier; HelloSign lets you just fire out a URL to as many people as you want, where they’ll simply confirm their email address and sign. All filled forms are digitally collected and stored in one easy place, making an entire process that may involve more than a hundred signers take less than a few minutes. An important part of effective workflow optimization is about where people end up interacting with a process and what the experience is like for those people. People must be allowed to engage with a business process from the places in which they most commonly conduct their work, and any interface with which they are presented must not force them to reconsider their context. When it comes to document management, much of this is solved through elegant integration with existing 3rd party tools and sites. HelloSign illustrates this approach nicely through a several tools and options. It starts at the very beginning of the process; when the user uploads a new document to be signed, they are given the option to pull a document directly from several 3rd party file management systems, including Dropbox, Box and Evernote. 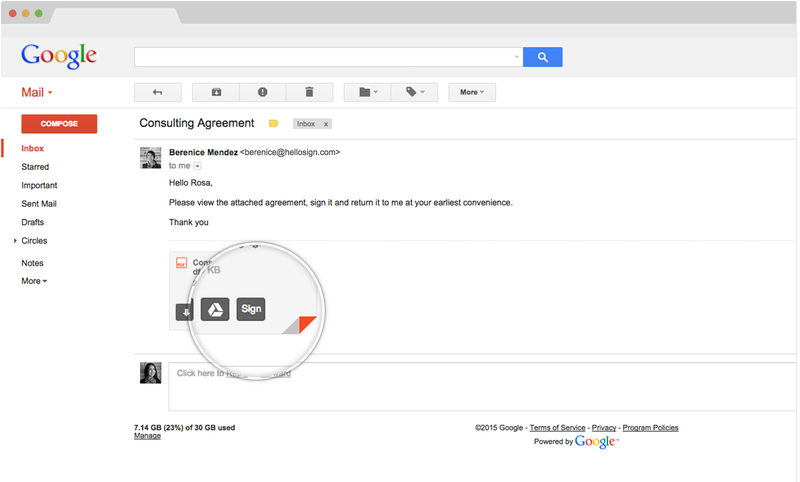 There is also similar functionality offered on the signing end of the process with the HelloSign Gmail integration; by downloading the HelloSign Gmail plugin, users can sign any document digitally from right inside their inbox. No need to download, open, sign, attach and send; just a few clicks from their most commonly used interface and they’re done. That of course includes their mobile device. 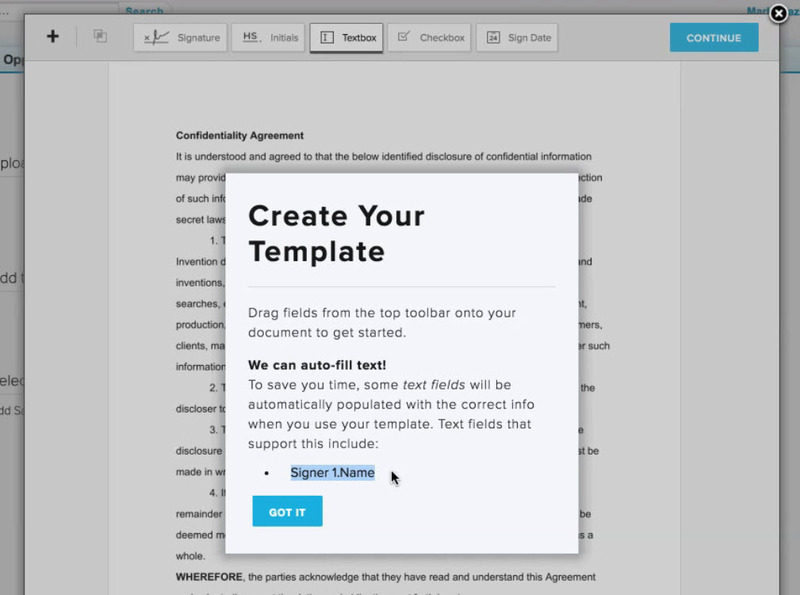 HelloSign also offers users of Salesforce.com to create and reuse document templates from right inside the SFDC interface; without leaving a Lead record (or an Opportunity, Account or Contact), a rep can quickly spin up an eSignature-enabled doc, send it out, and track its progress. The document automatically pulls in the information from the associated SFDC record (e.g., Name), and even stores doc copies in the notes of that record when signings are complete—the rep can continue to live and breathe in Salesforce. Things like this might seem small, but they truly are at the heart of the “flow” part of a “workflow”. Especially when you are asking someone to prepare or sign a legally binding document, it is always a bad idea to make users feel like they’ve had to leap to another path (or worse yet another product entirely) in order to complete what felt like it should have been one simple, consistent flow. It raises doubts regarding brand (and process) credibility and increases the risk of a user walking away from the process all together. Good document workflow optimization software will allow you to maintain full ownership of the end-user experience, whether you are selling your own software product that requires an embedded eSignature module, or you are getting people outside your company to sign digital documents that need to look like they’re entirely created and hosted by your company. HelloSign enables this kind of flexibility through a powerful API and a White Labeling framework that allows companies to build virtually any visual interaction layer atop of the full suite of HelloSign features. It just looks like another button in the existing interface with a few totally customized screens to follow. Then, when it actually comes time to send and sign, the HelloSign API takes over to handle the transactions. The final element of strong workflow management is accuracy; a tight, streamlined “process” is almost useless if the parties involved keep making mistakes throughout, forcing that process to restart all the time. In the case with agreements, and filling in form fields, you can imagine how expensively recursive things can get when people are spelling things incorrectly, forgetting to submit all the requested information, and putting stuff in the wrong place. HelloSign offers a few things to help mitigate most, if not all of that. 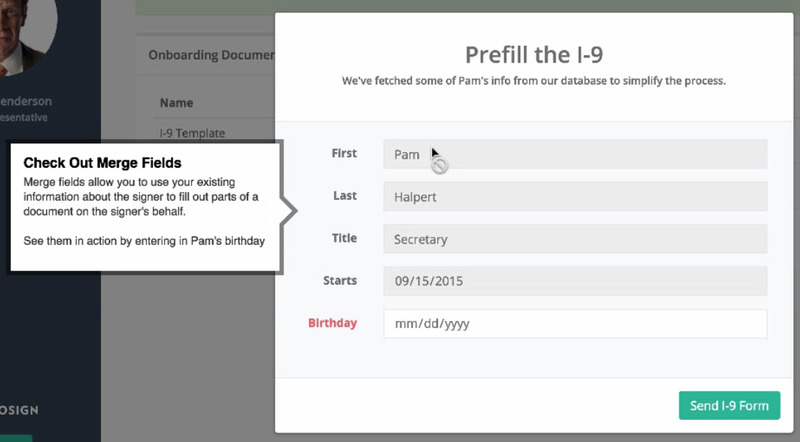 Merge fields are used by HelloSign to pull data from your own systems and prefill the electronic doc with information you already have stored about the signer or the context in which they are signing—names, addresses, dates, and anything else that may be relevant. This functionality is available both manually on creation of a new document (type in the information before sending), or automatically when using HelloSign’s API or SFDC integration (pulls from an internal company system / database or the SFDC record). Part of managing and optimizing agreement workflows is minimizing the amount of actual “work” required from people doing the signing. People get things wrong all the time when they are allowed to enter any data they want. A little validation goes a long way, and HelloSign provides a great illustration of how it can and should be implemented. Any field can be marked as Required to ensure that the signer cannot provide a signature without providing all the necessary information. Any field can also be guardrailed with validation rules to ensure that email addresses aren’t missing a ‘.com’, ZIP codes aren’t missing a digit, names aren’t accidentally spelled with numbers, and so on. The system even allows you to group checkboxes in order to make sure that at least one checkbox is selected and only one checkbox is selected. You’d be amazed how frequently little slips like that set a signing back by days, or even weeks. We hoped you enjoyed our illustrated tutorial. Software solutions for agreements workflow optimization and document management should be considered by every company looking to improve profitability and grow revenue, regardless of size; the HelloSign platform is an industry-leading, feature-rich eSignature platform; we thought merging the concept and the execution would make the perfect recipe for education with a healthy side of inspiration. When it comes to document workflows, now you know the what, the why, and the how. Hopefully, for the sake of your business, becoming an adopter is just a matter of when. I feel a comprehensive solution like Docsvault (http://www.docsvault.com) would prove to be a better bet than a specialized solution. I feel a comprehensive solution like Docsvault (www.docsvault.com) would prove to be a better bet than a specialized solution. You seem to be pushing this type of software a lot on your site. I would say there is a good reason for that and I really like the idea of getting all of this type of stuff off paper. Thanks! After working in a corporate office for 15 years, I know exactly how much time it taken up when you are tracking some paperwork that is going through the “channels”. With a system like this, there is a level tracing where the document that keeps those that have to sign a little more honest.